1. Tell us a little bit about your upcoming release, DECLAN’S CROSS? I loved writing this book! I know I always say that, but DECLAN’S CROSS is set (mostly) in Ireland, one of my favorite places. FBI agents Emma Sharpe, an art crimes expert, and Colin Donovan, a deep-cover operative, are in Ireland to decompress and get to know each other better. It’s November, cold, dark, wet, totally romantic. Toward the end of their stay, they get word that Julianne Maroney, a marine biologist from Colin’s hometown in Maine, is on her way to the tiny Irish village of Declan’s Cross. Alarm bells go off for the two agents. 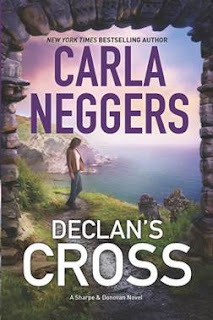 Of all the Irish villages Julianne could visit, why Declan’s Cross? It’s where an elusive, daring art thief first struck ten years ago. When Julianne’s new friend disappears, Emma and Colin are drawn into a deadly race to find a killer. 2. Who is your fictional character crush? I’m not positive who was first but I’m guessing it was the Scarlet Pimpernel. What a great character! 3. What enticed you to switch over from contemporary romance to romantic suspense? I’m all about getting the story that’s in my head onto the page. My Sharpe and Donovan novels are about two FBI agents who grew up within a few miles of each other on the southern Maine coast but in very different worlds. Their relationship and their work are at the heart of SAINT’S GATE, HERON’S COVE and now DECLAN’S CROSS. 4. What are you reading right now? I’m reading COLD, the first in a new British mystery series by my friend Stella Cameron. It’s set in the Cotswolds, where my husband and I are heading soon. View a beautiful slideshow of photos Carla took while vacationing/working in Ireland. broken heart. Emma and Colin are in Ireland for their own personal retreat. Colin knows he’s a reminder of everything Julianne wants to escape but something about her trip raises his suspicion. Emma, an art crimes expert, is also on edge. Of all the Irish villages Julianne could choose… Why Declan’s Cross? Ten years ago, a thief slipped into a mansion in Declan’s Cross. Emma’s grandfather, a renowned art detective, investigated, but the art stolen that night has never been recovered and the elusive thief never caught. Carla Neggers has been spinning stories ever since she climbed a tree with pad and pen at age eleven. Now she has millions of copies of her books in print in more than 30 countries, and more than two dozen of her books have placed on the New York Times, USA TODAY and Publishers Weekly bestseller lists. Declan’s Cross is the third novel in her acclaimed Sharpe & Donovan romantic suspense series that launched with Saint’s Gate and Heron’s Cove and has been praised as “a breathtaking reading experience” (Providence Journal), “gripping and suspenseful” (Nashua Telegraph), and “outstanding” (USA TODAY). Her popular Swift River Valley series debuted with Secrets of the Lost Summer, which spent four weeks on the New York Times bestseller list and garnered rave reviews, including a starred review from Booklist and a Top Pick from RT Book Reviews. Growing up in rural western Massachusetts with three brothers and three sisters, Carla developed an eye for detail and a love of a good story. Her imagination, curiosity and sense of adventure are key to creating the complex relationships, fast-paced plots and deep sense of place in.